Flatfoot may be an inherited condition or may be caused by an injury or condition such as rheumatoid arthritis, stroke, or diabetes. Treatment in adults generally consists of wearing spacious, comfortable shoes with good arch support. Your doctor may recommend padding for the heel (heel cup) or orthotic shoe devices, which are molded pieces of rubber, leather, metal, plastic, or other synthetic material that are inserted into a shoe. They balance the foot in a neutral position and cushion the foot from excessive pounding. For children, treatment using corrective shoes or inserts is rarely needed, as the arch usually develops normally by age 5. You may be able to relieve heel pain by stretching tight calf muscles. Stand about 1 ft (30 cm) from a wall and place the palms of both hands against the wall at chest level. Step back with one foot, keeping that leg straight at the knee, and both feet flat on the floor. Your feet should point directly at the wall or slightly in toward the center of your body. 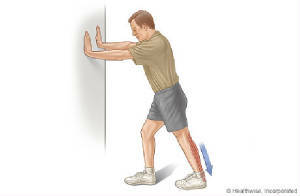 Keep the knee of the leg nearest the wall centered over the ankle. Bend your other (front) leg at the knee, and press the wall with both hands until you feel a gentle stretch on your back leg (calf muscle). Place a towel on the floor, and sit down in a chair in front of it with both feet resting flat on the towel at one end. Grip the towel with the toes of one foot (keep your heel on the floor and use your other foot to anchor the towel). Curl your toes to pull the towel toward you. Repeat with the other foot. To increase strength, later use 3 lb (1.5 kg) to 5 lb (2.5 kg) weights (such as a large can of fruit or vegetables) on the other end of the towel. Sit down on the floor or a mat with your feet stretched out in front of you. 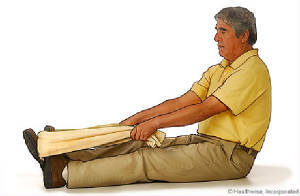 Roll up a towel lengthwise and then loop it over one foot (around the ball of your foot). Take one end of the towel in either hand and gently pull the towel towards your body to stretch the front of your foot. Repeat with the other foot. Some people—especially competitive athletes, people who want to return to a heavy sports program, or people who are highly motivated—may choose more intensive strengthening and flexibility programs. A physical therapist or trainer can help supervise a program recommended by your sports medicine specialist or a foot specialist, such as an orthopedist or podiatrist. Treatment with nonsteroidal anti-inflammatory drugs (NSAIDs), heat, or massage may help with foot pain and leg discomfort. If flatfoot is related to another condition, surgery or other treatment may be needed.